We had talked about it for roughly ten years. 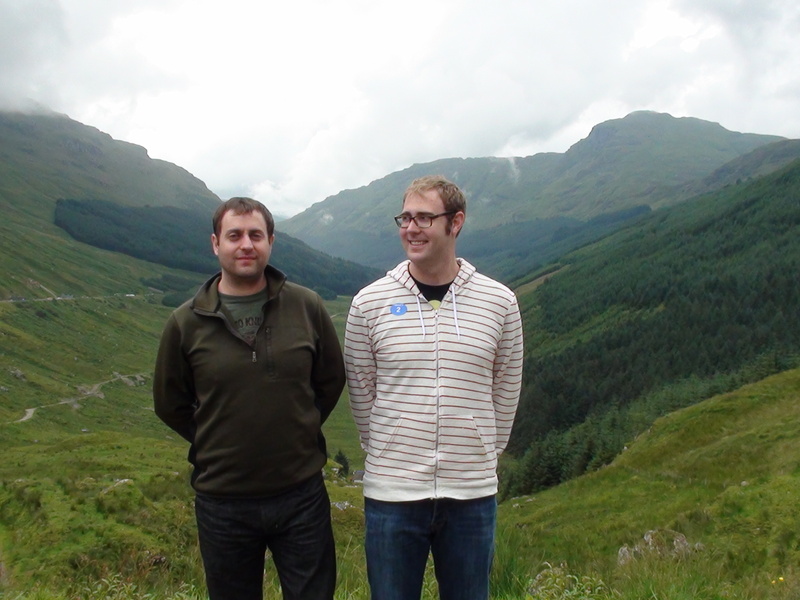 The last time we had a family discussion regarding a trip to the United Kingdom…we chose Maine instead. Now do not misunderstand me, Maine, is wonderful and we have since returned there for a repeat of what was an outstanding holiday. However we seemed to never settle on our UK adventure…until we did. In August 2012 we flew from the United States to London Heathrow Airport where we caught a shuttle to our hotel. Upon arriving at the hotel, once again… this being our second transatlantic flight, we felt somewhat zombie like. Thus we thought a traditional English Breakfast would be in order. How delightful and delicious with plump sausages, blood pudding, and baked beans we ate our fill with workmanlike proficiency . Now we were beyond sleepy. As we sat on a couch in the ornate reception area Mary Jane was told that our rooms would not be ready for several hours. I wondered if we looked somewhat like the characters from the old television show the Beverly Hillbillies? I received my answer when I told the smartly dressed hotel professional that we had no where to go and were much to tired to do so if we did and therefore she could find us on the couch for the duration of our multi-hour wait. She suddenly found our rooms…all clean and ready for our arrival. We had arrived at the beginning of the 2012 Summer Olympic Games held in London. As we flipped on the television in our room we quickly noticed that the coverage from the British point of view looked like a different Olympics than what we had been watching just before we left the US. Soon sleep overtook me and the events of the time prior to our embarking consisted or much needed rest and a lovely Indian meal at the hotel restaurant. We boarded the Princess Ocean Liner at Dover…and the cliffs really are white. The ship was the smallest in Princess fleet and held under seven hundred passengers. By contrast the Caribbean Princess that we had sailed on twice is one of the fleets largest vessels holding over four thousand passengers. I thought that the smallness of the ship would be enjoyable…not so many opportunities to get lost. Later during our voyage I discovered that there was a drawback to being a small vessel…but that is for another blog. Our first stop was the island of Guernsey. It is a British Crown dependency. It was liberated from Nazi Germany on May 9, 1945. 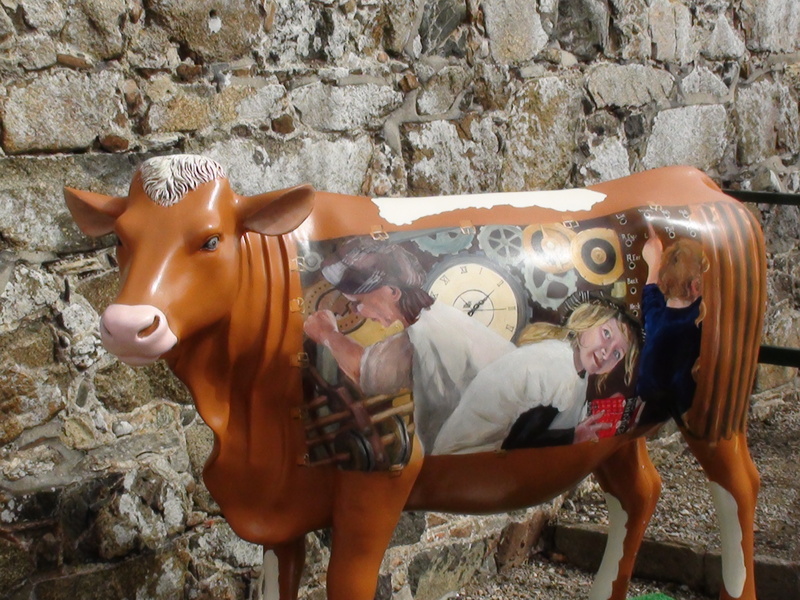 Guernsey had its’ own currency or the Guernsey pound…but we were cautioned on ship to insist on trading in British pounds as the Guernsey pound was virtually unusable anywhere but Guernsey. We toured fort Grey and marveled at the gun casements and the cannonball that was forever lodged in the wall of the fort. We stood in rapt attention as the cannon was shot at noon sharp…as it is every day for hundreds of years by persons dressed as british soldiers from the era when the practice began. We also discovered that the famous author Victor Hugo lived in Guernsey. 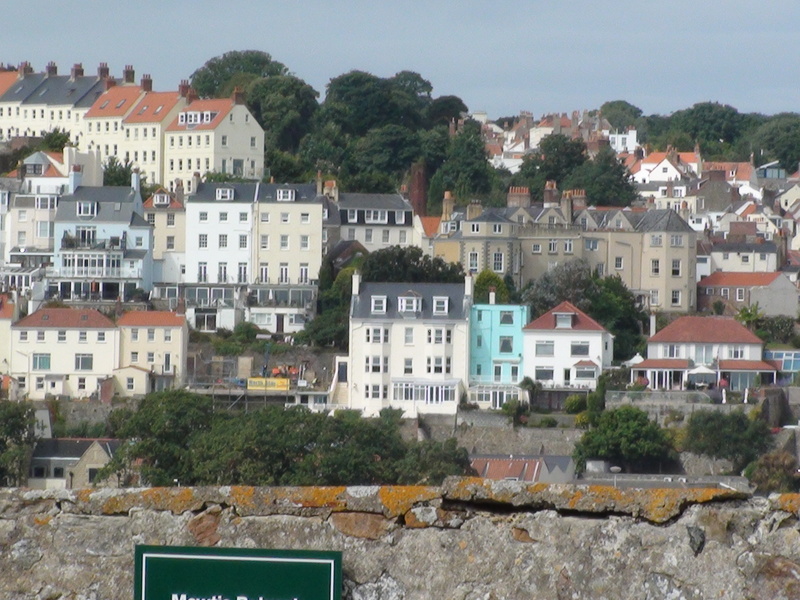 Also that the island was famous for its’ ice cream…of which we partook, but insisted in paying in British pounds. 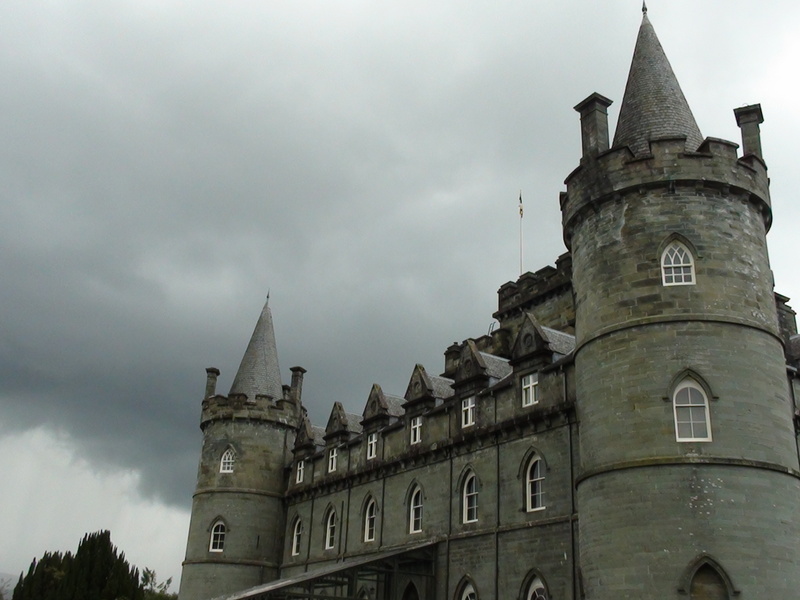 I have chosen in this series to jump around a bit and so comes our bus tour of Scotland that culminated in the fascinating Inveraray Castle. If you are a fan of Downton Abbey, as we are, you may recall the Christmas 2012 episode where the Grantham family visit the home of their cousins in Scotland called in the episode Duneagle Castle. 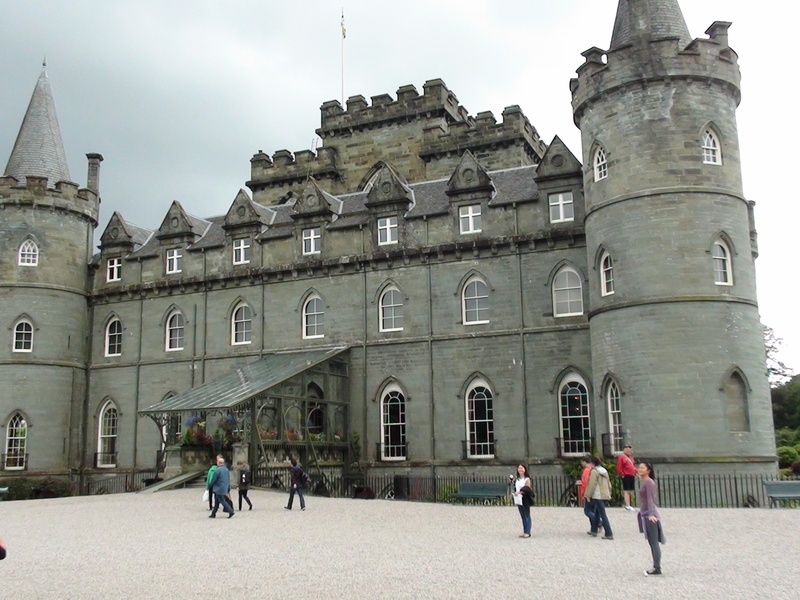 Inveraray Castle is the home of the Duke of Argyll who is the chief of the Campbell Clan since the seventeenth century. 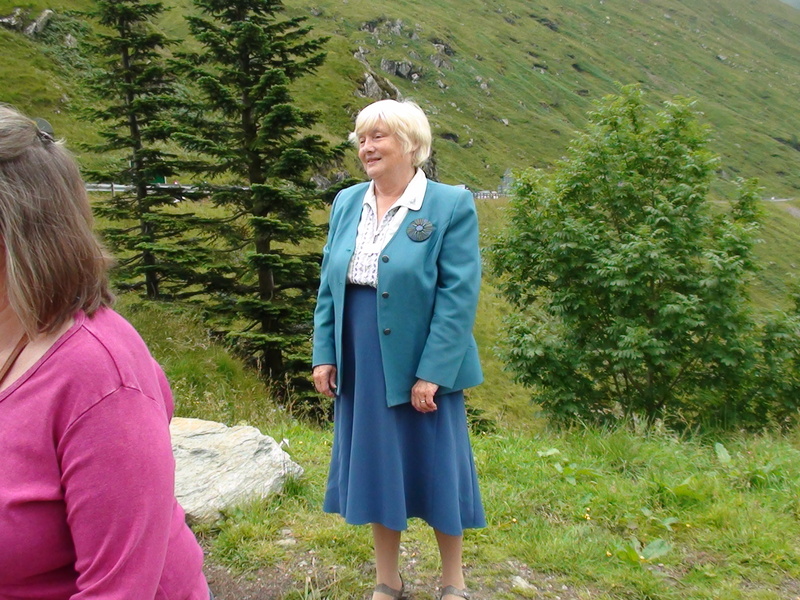 Our tour guide was a delightful woman of respectable age who simply brought Scotland alive with her lilting speech and stories. 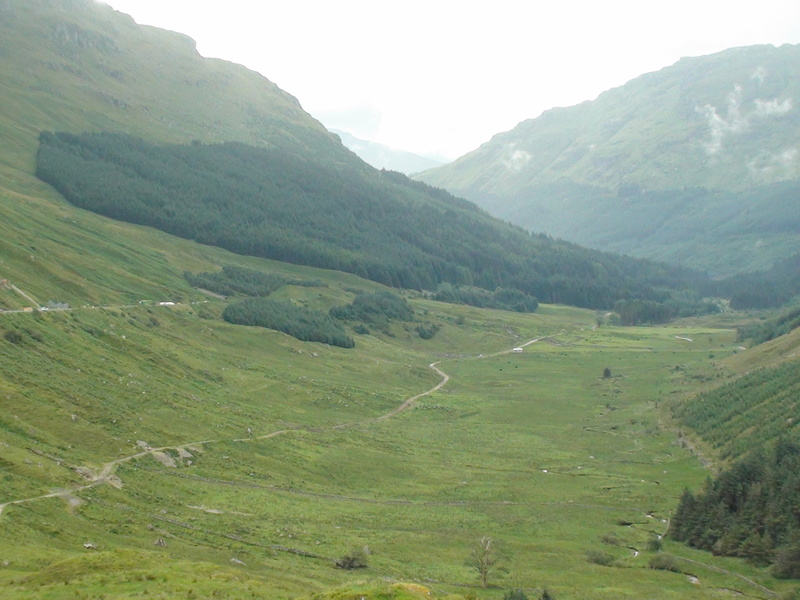 As we rode through the Scottish country side I think that I have never seen such natural beauty. As we drew nearer the castle our tour guide began to be more excited. She cautioned us that indeed the current Duke and his family did reside at Inveraray and that if we were lucky he might come down to greet us. She went on to instruct us that we must not say, “How ya doing duke?” But rather we should refer to him as, “Your Grace.” So, with much fear and trepidation at the prospect of really meeting royalty we arrived and soon discovered that the Duke had not only agreed to come down but that he was assisting in the gift shop. The castle is a magnificent structure. 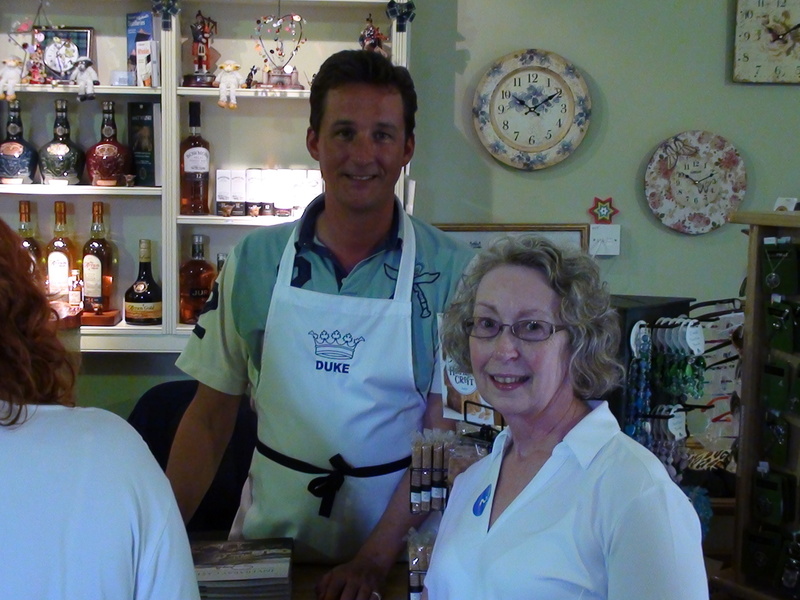 Seeing the Duke dressed in his apron that said “Duke” on it was somehow reassuring as was his strange expression when I referred to him as Your Grace. Sounds like a great trip! 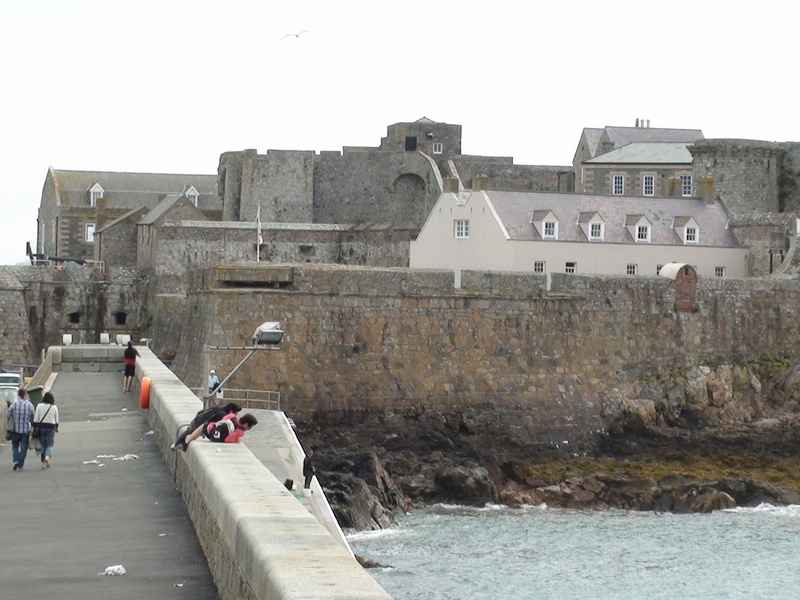 Would love to visit Guernsey and the castle in Scotland sounds fascinating – another one for my list. It was a great trip. 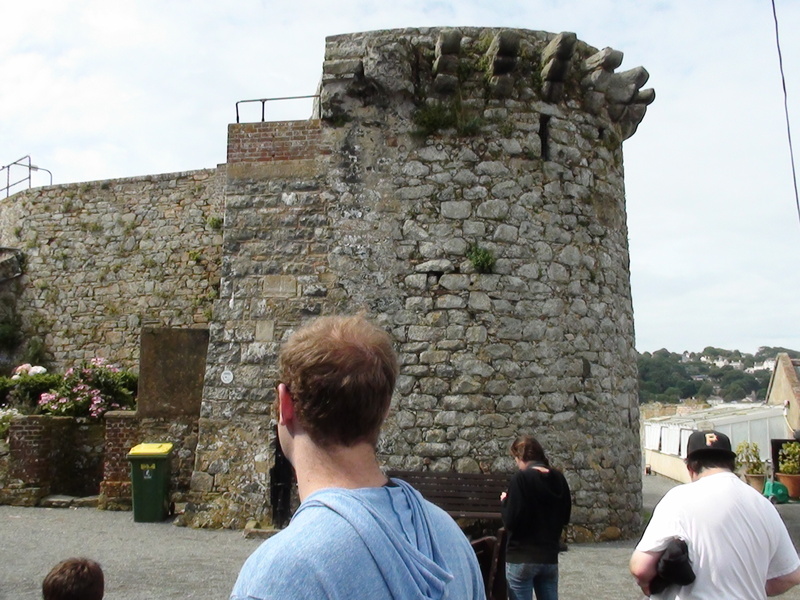 Both Guernsey and the castle were extraordinary! 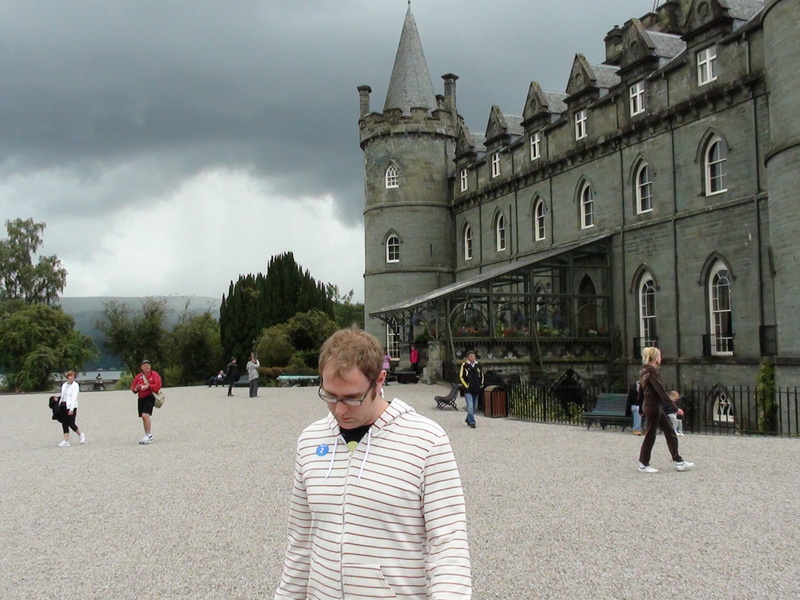 I want to return to Scotland as it is a magical place. Thanks so much for reading.